I do love vegan adventure in the morning, which is exactly what I found myself on last week. After hearing on Twitter (where else) that there was a new raw restaurant in Holborn I hatched a cunning plan to fit it in to my busy schedule. Opening times and menu details proved pretty elusive until I managed to find them on Twitter, but sadly no menu and I was disappointed to find they shut at 4pm. No dinner then. Never fear, I am anything if not flexible creature and therefore decided to pay them a breakfast visit. So began trip number one. A short walk from Holborn station I found myself in an empty shop, of people and fridges. Thankfully someone appeared from out the back before I had to do that self conscious ‘helloooo?”. The fridge by the entrance was empty save for some drinks but the display by the counter did have some items in it, but at quick first glance it was all a bit cheesy, which then made me question whether the neighbours were also vegan. I ordered a hemp and berry smoothie (£3) asking of course if it was vegan. The girl that served me was really friendly so soon I felt at ease to ask more questions and take photos. It was then I spotted the section of raw lunch items up on the menu board. 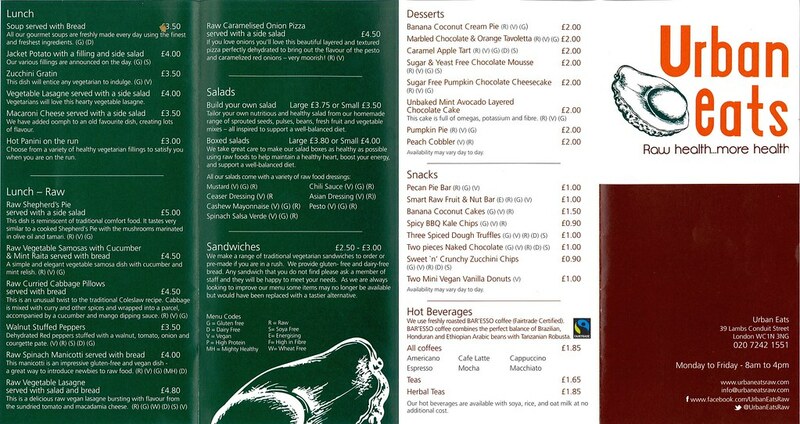 The board does not highlight vegan items, you need to look at takeaway menu for that, or ask. With a bit more confidence I also bought a chia oatmeal (£2.50) and some BBQ kale chips which were £0.90 (a slightly bigger pot in whole foods will set you back a fiver). They also do a zucchini chip but these had sold out as they were so popular. I thought the place had only jut opened recently but until November they had been serving meat and then transformed into a vegetarian restaurant. 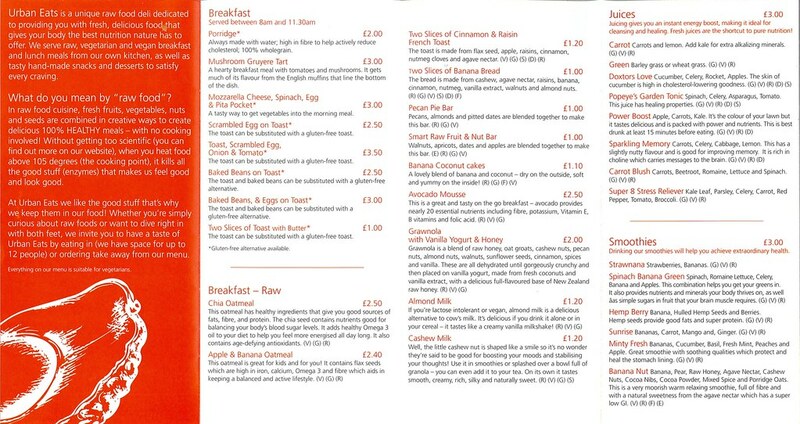 Back at work I was able to review the menu at a more leisurely pace and saw a whole lot of raw breakfast options. The chia oatmeal was interesting, I keep hearing about chia seeds everywhere at the moment, they can be used like flax seeds as an egg replacer which is why I think the texture of the oatmeal was gloopy. It was also really cinnamony but after a couple of spoonfuls I really got into it. The raisins in it were super plump and juicy and it made me feel all virtuous and healthy after. The kale chips had a kick and the flavour was really intense, I have to admit I prefer Sash’s but am really keen to try out the zucchini chips. Obviously I had to go back, would the breakfast and lunch items live up to my expectations? Praise the raw gods, I was not disappointed. Time for trip number two. I called the day before to check whether lunch items would be available first thing in the morning and was told they would set aside the last slice of vegan pizza for me. Well that was just asking for raw Wednesdays to be resurrected! This time Anneka was there to have a chat with, she was so full of energy and passion for what she is doing. She makes everything herself, 90% of which is organic too. Plus she has lots new ideas and plans for classes which will be held on the premise. And the food really does speak for itself and it is all so reasonably priced as well. Loving her raw cheeses which were in the manicotti and on the pizza (ah-mazing pizza!). I really cannot wait to go back and try everything else and with the closure of Saf in Shoreditch is leaves a nice little space for Urban Eats to flourish. Cick on the menu to see the larger images. The website per the leaflet is still under construction but you can like them on Facebook or Tweet them. Better still: GO THERE!!! 9th October 2013 Those amazing folks at Veganic sent a REALLY impressive box to us recently. A whole load of their Violife vegan cheese slices and grated pizza cheese to try. Thanks so much for popping in to see us and so glad you enjoyed our food. Looking forward to seeing you again. Thanks so so much for the mention and amazing pictures you’ve taken of our shop and products, really touching you helping us out like this. Raw health…more health! Sadly, having spoken to Anneka, she tells me they’ve closed their restaurant, but are still doing catering. They can be contacted via their Facebook page, email info@urbaneatsraw.com, or call Anneka Akpuche on 07507 214 756 or David Hunte on 07916 126 313.